Can I work long distance with Jasmine Sky Designs? Yes. I’ve has been working long distance with women internationally since 2001. I call this working ‘virtually’ – remotely via email, on the phone or on video Skype. Can I work in person with you? Absolutely! I welcome you with open arms to my design studio on The Big Island in Hawai’i for your Design Session. What is the process you use to design and create my art wear? Over the years, I’ve developed a very efficient and streamlined four (4) step creation process for working either in person or ‘virtually’. To help us hit the ground running in your Design Session, I’ll ask you to complete a short preliminary questionnaire which includes a request for photos and measurements. Guided by your design wants and needs, I’ll take you by the hand and help you imagine your dream-dress; all the way from the style you choose, to the choice of silks you’d like to make it up with, and right down to the colors and even brush-strokes of the art work you’d like painted on your silk. Once your island art wear is completely designed, I will provide you with a quote for what it will cost. Your quote includes; any color or art work swatches you want, wrapping directions for your garment style, the start date and shipment date of your island art wear and a Video Skype Styling Session once your receive your art wear so that you can feel 200% confident with how to wear it in all it’s many styling options. You can sit back and relax now as I go into “creation mode”. I don’t feel comfortable buying clothes without trying them on. Is there any way I can try these styles on without traveling to your design studio and showroom? So that you can order your hand painted silk art wear with 100% confidence, you can choose to have samples mailed to you so that you can try them on. A ‘hold’ will be put on your credit card for the total value of all the samples you want to send. This hold is removed upon returned receipt of the samples. One (1) hour video Skype fitting appointment with me. Wrapping directions for each sample. If your video Skype session runs over the 1 hour allotted time, an additional charge for my time will be charged at the rate of $100/hour or any increment thereof. Because of their wrap-&-tie-on construction, trying the sample on will help you determine which style is right for you and what your fitting customization needs, wants and desires are. If you require extensive customizations (changing of the style itself) beyond fitting, this will be handled in your video Skype fitting. How much does a Jasmine Sky Designs Original cost? I can only accept 20 orders per year. This ensures that you get my undivided attention, not just in the design process but also when I’m in “creation mode” making your island art wear! How do I book you and what’s your payment plan? I require a $500 retainer fee. which begins your Design Session. This retainer is credited to the final cost of your island art wear. 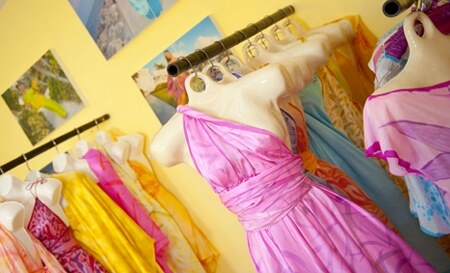 Once your dress is designed, I will provide you with a quote for the cost of your art wear. Your quote includes; any color or art work swatches you want, wrapping directions for your garment style, the start date and shipment date of your island art wear and a Video Skype Styling Session once your receive your art wear so that you can feel 200% confident with how to wear it in all it’s many styling options. Your payment in full reserves your spot in my production schedule. I am also flexible with breaking up payments along the way but your art wear must be paid in full before I begin to make it. 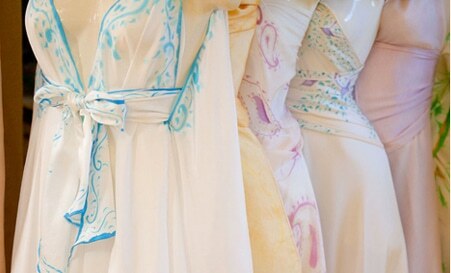 Can I receive silk swatches, color swatches and/or art work swatches? What is the turnaround time for a Jasmine Sky Designs original? how long it will take to make your art wear. What is the Jasmine Sky Designs return/refund policy? At Jasmine Sky Designs, we stand behind our product 100%. We take pride in our outstanding attention to detail and heart centered customer service. Your silk art wear is hand painted and sewn by Jasmine herself with the utmost attention to detail and with the care that she would use as if she were making a gift for a dear friend. I only accept 20 brides per year. because I want to ensure that you get my undivided attention — not just in the design process but also when I’m in “creation mode” making your dress! I will be giving you the absolute best of myself to create a garment of the highest quality — one that literally feels like “magic” to wear because it is made for one person and one person only: you. I stand behind my product 100%. If, for any reason, I have made an error in making your art wear, I will repaint any part or all of your order one time after you return your art wear. The only additional cost to you is postage.